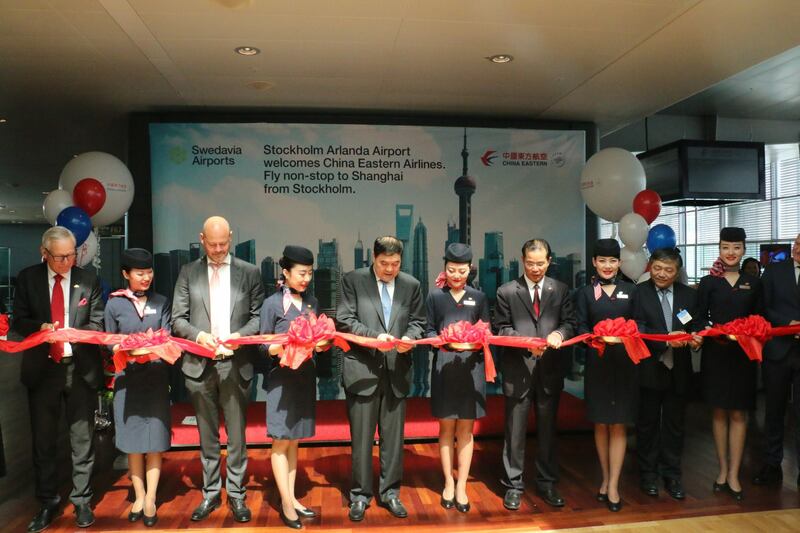 Just a moment ago, we witnessed the smooth landing of China Eastern's first direct flight from Shanghai to Stockholm. This is an exciting and historic moment. China Eastern's official opening of this route is a major event for China and Sweden to expand and deepen friendly exchanges and mutually beneficial cooperation. It is good news for people of both countries who long to have closer contact and communication with each other, enhance mutual understanding, and further deepen cooperation and friendship. 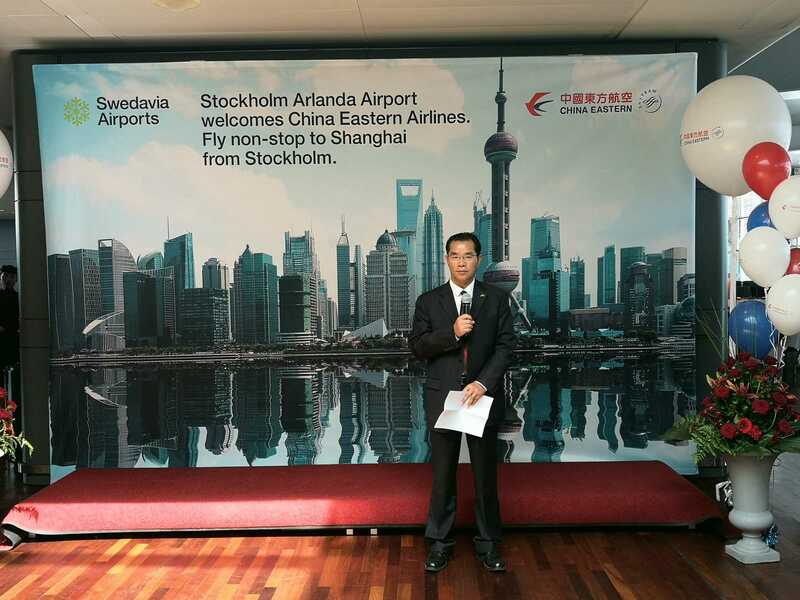 The opening of this new flight service will make it much more convenient for Sweden to connect with Shanghai and China's southeast region. On behalf of the Chinese Embassy in Sweden, I would like to express my warm congratulations on the opening of this new air route. As a Chinese saying goes, good friends feel close even when they are thousands of miles apart. 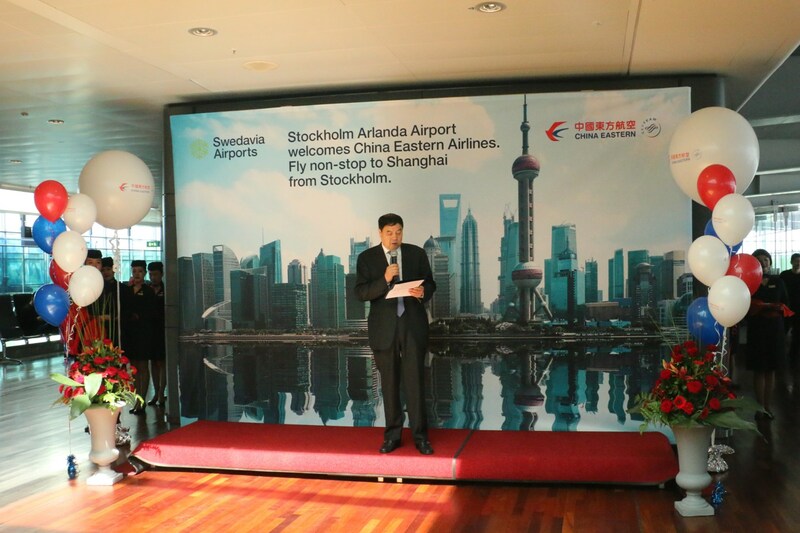 Just 10 days ago, we celebrated the 30th anniversary of the opening of the Beijing-Stockholm air route by Air China. The opening of the direct flight between Beijing and Stockholm could be regarded as a symbol and a concrete achievement of China's reform and opening up. It has greatly facilitated mutual visits between China and Sweden and their cooperation in fields such as trade, investment, tourism, and people-to-people exchanges. As China celebrates the 40th anniversary of its reform and opening up, China Eastern's opening of the route between Stockholm and Shanghai carries special significance. We all know that, last year, China-Sweden bilateral trade volume enjoyed a strong increase of 19.5%, reaching a record high of USD 15 billion. The number of bed nights for Chinese tourists in Sweden exceeded 400, 000, and the total number of Chinese students studying in Sweden exceeded 8,000. The number of Swedish people visiting China has also continued to increase. After the 19th National Congress of the Communist Party of China, which was held successfully in October last year, China has embarked on a new journey to build a modern socialist country in all aspects. One of the major strategies is to pursue development with its doors open wider, and to further its opening up to the outside world. At the Boao Forum for Asia Annual Conference 2018 in April, President Xi Jinping solemnly announced a series of new measures for further opening up. We can say that the opening of the new route between Stockholm and Shanghai meets the demands for further developing China-Sweden relations and expanding bilateral cooperation. It is a new symbol and a new achievement of China's opening up. As the Belt and Road Initiative cooperation is being carried out in full swing across Eurasia, the opening of the Shanghai-Stockholm direct flight will undoubtedly enhance China-Sweden cooperation under the BRI framework. At present, relevant Chinese government agencies and localities are actively preparing for the first China International Import Expo, which was initiated by President Xi Jinping and will be held in Shanghai in early November. The government of Sweden has confirmed to send a high-level delegation to participate in the National Exhibition, and many Swedish companies have already signed up for the exhibition for enterprises. We warmly welcome our Swedish friends to take the Shanghai-Stockholm direct flight of China Eastern Airlines and attend this Expo in Shanghai.